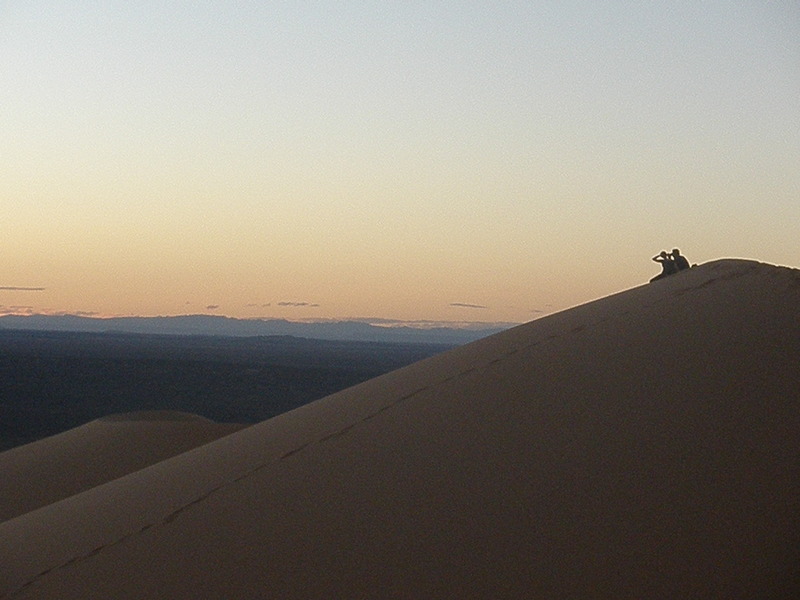 Read part 1 and part 2 of Tom’s Sahara desert adventure. The fall was not a heavy one but it was enough for me to stay lying down as I caught my breath. Overhead the rapidly fading sky saw the iridescent sunset replaced by an inky blackness. From my vantage point on the side of Erg Chebbi I could just about make out the comings and goings at the base camp far below. I hadn’t misjudged the scale of the massive dune when I ascended it but I certainly neglected to remember the most basic rule of gravity: What goes up must come down. The subsequent 10 minutes of my descent saw me tumbling down the deceptively steep sand mountain. My bid to find a foothold and some kind of balance repeatedly ended in futility. Sadly, my shorts, already the victim of an embarrassing tear as I mounted a camel earlier on, were filling up with sand. Not to be deterred I lit a cigarette, chortling at my predicament as the stars gradually appeared over the desert. Eventually I tumbled back into camp, my companions lying sprawled in varying states of relaxation. They were none the wiser as Carlos piped up, passing me a cup of mint tea. He’d valiantly made it halfway up the Erg before losing his footing one too many times and turning back in frustration. The poor man still looked exhausted and the obvious disrepair of his clothes suggested he too had taken the direct route back. His wife Francesca hid her laugh with a cough. I tried to speak but instead coughed up a small cloud of sand. A refreshing draft of mint tea cleared the airways, however, and I was soon telling my friends about the setting sun and the nameless, yearning excitement it left behind. The tale of the undignified return trip would have to wait for another day. 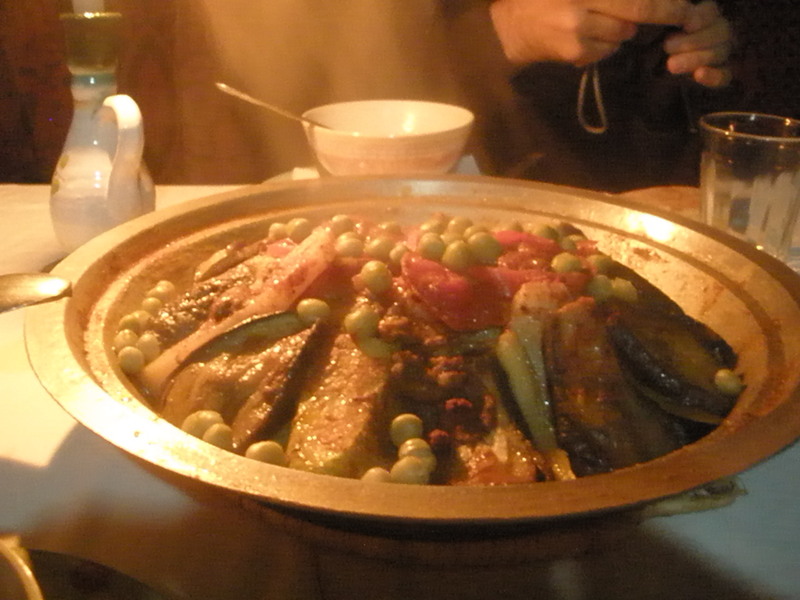 We collapsed into a tent where we dined on steaming hot tagine and swapped tales of our adventures. The evening proceeded in a wonderfully communal fashion. Our food was another example of effortlessly tasty Moroccan cuisine. Before long we had were back underneath the stars, a cool wind brushing through the camp, our bellies suitably appeased and I sporting a fresh pair of untorn shorts. Jakani had rounded up his friends along with a row of traditional tam tam drums; an impromptu concert was about to begin. A roaring fire cast a spectral glow on the scene and before long the droning berber chants and hypnotic percussion left us slackjawed with amazement. The camp was its own little bubble filled with laughing, dancing and wailing, and although our attempts to sing along were left somewhat wanting the intent was pure. The less said about our efforts in emulating the complexities of traditional tribal drumming the better, however. 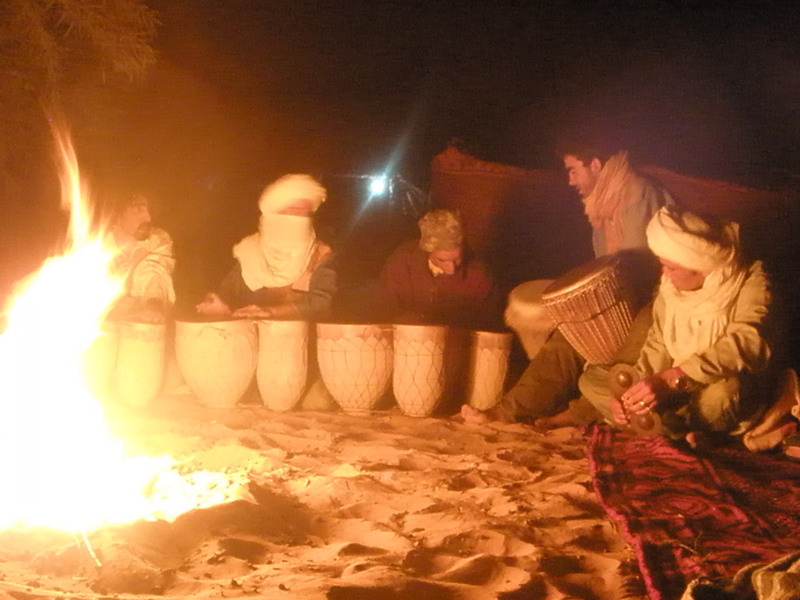 Later, as we watched the stars and felt giant Erg Chebbi brooding behind us, its size somehow casting a shadow on the pitch black desert, we came to a silent, shared conclusion. Jakani and his friends had welcomed us with open arms and ensured our first desert experience was a joyful one, but it was still clear the Sahara had revealed nothing of its complexities, its myriad mysteries stretching forth under an infinite sky. Tagged Berber, Desert, Drums, Erg Chebbi, Morocco, Music, North Africa, Road Trip, Sahara, Tam tam. Bookmark the permalink.